Are you our newest board member? 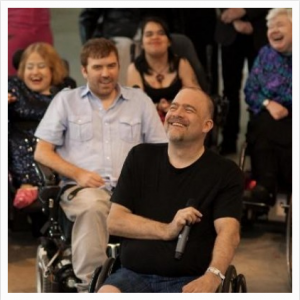 Realwheels is an award-winning Vancouver-based professional theatre company that deepens audiences’ understanding of the disability experience. A vital part of Realwheels’ work is community engagement. We’re seeking a talented and conscientious volunteer board member with a background in RMT, chiropractic, or physiotherapy to help develop our vision of combining theatrical excellence with a commitment to inclusion around disability. Board members serve a two-year term, with eligibility for renewal. The board meets approximately 6-8x/year to review and discuss projects. Additional committee time may be scheduled, pending our annual goals. Excellent strategic and analytical thinking skills combined with a practical and pragmatic mindset and a strong interest in serving the non-profit arts sector. Experience on an arts board is preferred but not required. Kindly print “Board Member submission” in the subject line.